If you are choosing a vulnerability scanner for the first time or struggling to get the most out of Checkmarx, here is why you should choose Acunetix as the foundation of your application security scanning program. 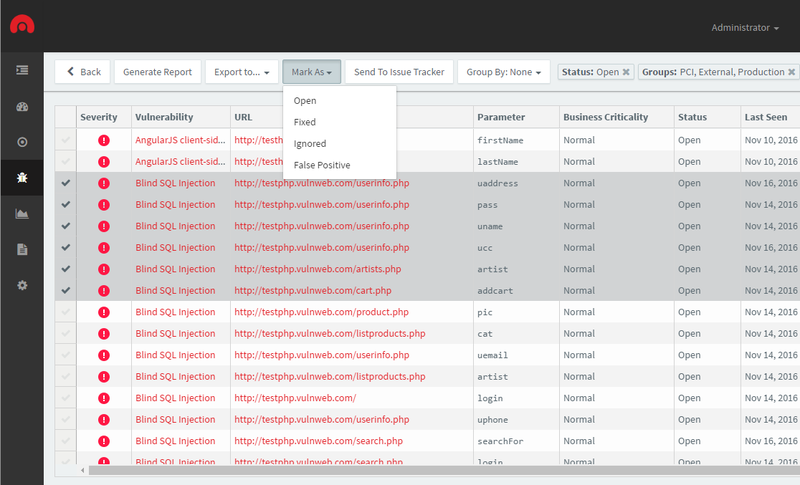 You need a web application security scanner that sees every web application your business uses the way an attacker would. You need a solution that identifies security issues in the OWASP Top 10 and beyond, with a minimum of false positives. You need a solution that can give you those accurate results no matter what web technologies you use, now or in the future. Checkmarx and Checkmarx competitors like Veracode, Fortify, IBM AppScan Source, SonarQube, and Coverity offer robust static application security testing (SAST) solutions. Static code analysis (SCA), also known as source code analysis, is important as part of a secure software development lifecycle (SDLC). However, source code analysis tools are only part of the picture. To get a full-spectrum view of how your web application affects your security posture you also need security software built from the ground up for dynamic application security testing (DAST). Acunetix is that tool. No matter what technologies your business depends on, Acunetix gives you a reliable picture of your web application security posture. If your business depends on applications that run most of the logic on the server side, using technologies such as Java, PHP, Python, or Ruby, Acunetix can map it out comprehensively and identify everywhere the end users can input or manipulate data. Acunetix offers a broad range of solutions that fit your business’ size, security needs, and IT infrastructure. Acunetix vulnerability scanner is available on both Windows and Linux, and also offers multi-engine options for distributed scanning. Since a dynamic web application scanner can see the application as it is running, it not only identifies software vulnerabilities but also misconfigurations that leave data at risk. Acunetix sees the application exactly as an attacker sees it, with far less false positives than a solution that only has access to the code. Every version of Acunetix also offers industry-leading speed in its scanning engine. Our engine has been tested, tuned, and engineered over time to become the fastest, most sophisticated web application scanning engine in the industry. So, not only will your security team get the most comprehensive inventory of security flaws with minimal false positives, but it will also get them in less time than other dynamic web application scanners. Though the request/response model adopted by most DAST tools identifies a broad range of security vulnerabilities, it falls short in identifying issues that do not immediately respond to a request sent by the scanner. That includes vulnerabilities like XML External Entity flaws (XXE), Blind Cross-Site Scripting (XSS) attacks, and Server Side Request Forgery (SSRF) attacks. Only Acunetix gives you the power of AcuMonitor. When an XXE, Blind XSS, or SSRF attack test, in an Acunetix scan, later proves successful, AcuMonitor sends an email letting you know that the vulnerability is present and exploitable. Though traditional dynamic security analysis tools would have missed the issues, AcuMonitor gives you that increased coverage and increased confidence. For businesses who depend on web applications that run Java, ASP.NET, or PHP, Acunetix also gives you the advantage of AcuSensor. AcuSensor is an Interactive Application Security Testing (IAST) agent, installed on the web server, that gives the scanner even more information about the running web application. Acunetix already provides best-in-class DAST, but this increased visibility allows the scanner to return even more comprehensive results with even fewer false positives. It also helps the software development teams improve code security more quickly because it identifies exactly where the security vulnerabilities are detected in the code and reports debugging information.